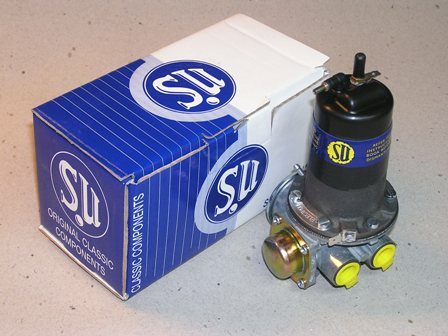 Troubleshooting guide for all classic cars and trucks that use SU mechanical (points type) fuel pumps. All of a sudden, as you are driving along without a care in the world, the engine starts to stumble and finally quits altogether. You turn the key off and on several times but the engine refuses to start. Absent also is the reassuring "tick, tick, tick" of the fuel pump - damn! The first response is to reach under the bonnet (in the case of the T series cars) or under the car by the right rear tire on late TFs, MGAs or MGBs and give the pump a few healthy whacks with whatever tool is handy (please do the whacking gently with something like a screwdriver handle, the idea is to get the pump to restart, not to beat it into a bloody pulp). If the familiar ticking returns to the pump, you can continue on your trip, knowing that you are going to have to do something about the pump when you get home (and maybe have to whack it a few more times on the way). What happens if, after being whacked a few times, the pump doesn't respond? First, while you are on the side of the road, remove the gas cap. If you hear a whoosh of air entering the tank, you have probably solved the problem. Just leave the cap off until you can get to an auto parts store and get a new vented cap in the case of the early MGBs (if the car is a T series, you will have to leave the cap open until getting to your destination and then find a way to clear the vent in the cap). If the car is a late MGB that is vented through the charcoal filter, you will have to trace the vent line and find where it is clogged. If, after removing the gas cap, you are still not getting fuel, remove the gas line from the rear carburetor and with it positioned such that the gas will go on the ground (I know, environmental concerns! But we are desperate here, OK? ), turn the key on. If you get fuel flow now, then the trouble is in the carbs (stuck float, etc). Still no fuel flow? Now you will have to call AAA, a friend with a tow dolly or push the darn thing home. Next day, how to proceed? Buy a new pump (one of those square, run all the time, make a lot of noise, Facet pumps), a new SU pump (maybe one of those new, all electronic ones), get the old one fixed, or...? First, let's make sure that the pump is at fault. Take a meter or test light and with the key on, check for 12V between the terminal on the cap of the pump and ground. If you don't have 12V here, find out where you are losing it - you will have to go to your shop manual, look up the schematic and follow the line back from the pump to the source of 12V. If you have the 12V at the pump terminal, check that the ground is good, either with an ohmmeter or by jumping a known good ground to the pump with a piece of wire. If the ground is bad, again, trace the wire from the pump to the ground point and repair the discontinuity (if you are working on an MGB, the ground point is under one of the license mounting bolts in the trunk). See my companion article on Ground Point Preparation to ensure a good ground (earth) connection. If you are getting voltage to the pump and have a good ground, you need a new pump, right? Not yet! There are a couple more checks to make before condemning the pump, particularly if you noticed that the pump was getting hot when you left the key on for an extended period of time. Remove both fuel lines from the pump and turn the key on. If the pump doesn't run with both fuel lines disconnected, skip the rest of this article and go down to the list of business or individuals who repair or restore the pumps. If the pump runs ok with the fuel lines off, one of them is probably clogged. Reinstall the fuel line from the fuel tank and try again. If the pump runs and sends fuel out of the outlet fitting, then you have a clog in the line to the carburetors. If the pump doesn't run, or if it just clicks a couple of times and then stops and was hot as stated above, you have a clog in the line from the tank to the pump or internally in the tank (if you have a late TF, MGA or MGB, this would have been indicated by the lack of gas running off your elbow while you were disconnecting the line from the tank to the pump). If you have a MGA or MGB, disconnect the fuel line from the fitting on the tank and again turn on the key. If the fuel pump runs now, then the clog is in the line inside the tank. If this was the problem, it is time to think about getting the gas tank cleaned out or you will be facing the same problem later on. Check whichever line has a suspect clog for kinks, smashed line, etc. Try blowing it out with compressed air to insure any clog is removed. If there is a filter in line, replace it with a new one. Still not getting fuel? Now it is time to contact one of the people listed below to take advantage of their SU fuel pump services. There is one more situation that will cause fuel starvation that hasn't been addressed above. If your pump is running continuously, but no fuel is being pumped in to the float chambers (and your pump is a SU pump rather than an aftermarket pump like the Facet pumps that normally run continuously), then you have an air leak on the inlet side of the pump, or you are out of fuel. Check the fuel level in the tank, then check the line from the fuel tank to the pump for any loose connections or holes in the line. Be particularly suspicious of any flexible lines used to transition the metal lines to the pump. If no leaks in the lines can be found in the lines, try running a line from the inlet side of the pump to a container of fuel. If the pump starts pulling fuel from the container and stops pumping after the float bowls are full, then you quite possibly have a hole in the pickup tube in the tank above the level of the fuel. If instead, the pump still runs continuously and doesn't pull fuel from the container, the pump itself has a leak on the inlet side and will need to be repaired. Again, contact one of the people below for assistance. Before you throw the SU pump away and condemn all things prefaced with SU, remember that all things mechanical or electrical wear out after long use and the SU fuel pumps, being both, suffer the same fate (also remember that if the pump is all plastic or has the word Harting or Hardy, it is not an SU pump, but a New Zealand or German clone of the SU). The Mazda truck we used to have came with one of the square Facet, run all the time, make a lot of noise pumps on it and after several years it too, died. An earlier Courier pickup had a Japanese SU clone, which also died. All of these pumps died somewhere around 75,000 to 100,000 miles, at about the same mileage that a new SU fuel pump will fail. My point is that the SU fuel pump will last about as long as any other electric pump that is on the market for use on the MGs, possibly longer if it is an all electronic pump or one converted to solid state. Comments on "SU Fuel Pump Troubleshooting Guide"
Knowledge is power. Thank you. If all else fails, check the inertia switch if you have one. It lies there quietly corroding inside until one day the connection is lost. It takes minutes to sand and remove the corrosion but you have to remember about it.